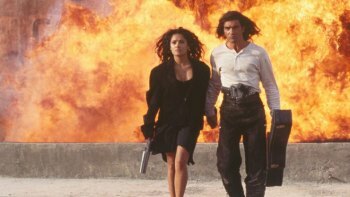 Director Robert (El Mariachi) Rodriguez made his first film in 1992 for $7,000 in fourteen days. It went on to make two million dollars at the boxoffice. Since then he's directed "Planet Terror," "Sin City a Dame to Kill For" and other features. Rodriguez known as the do it your self king is giving his fans the same opportunity. In celebration of the anniversary of El Mariachi, Rodriguez is now giving five filmmakers the exact same constraints he had to make a feature of their own. For those keeping score, that's $7,000 to shoot and edit an entire feature film in just 14 days. Now, it seems the contest would be a little fairer if Rodriguez would be willing to adjust his contribution for inflation purposes, but hey, that's Hollywood, baby! Plus, Rodriguez himself will be making a feature of his own for the competition—an effort he hopes will bring him back to his roots. In partnership with Rodriguez's El Rey Network, the competition will also be filmed for a new six-episode series called Rebel Without a Crew, based off Rodriguez's popular DIY filmmaking book of the same name. Go90 will stream the six-episode, one-hour series about the making of the films as well as the final feature films. Filmmakers must be available to shoot for six weeks in October/November 2017 in Austin, Texas, so clear your schedule. To apply, you must be a U.S. resident over the age of 18 who has yet to direct a full-length feature. You also must have access to a script to which you own all the rights. Submissions are open now. If selected you will be flown to a pre-selected location. You must be available in Oct/Nov and March. The application consists of a lengthy series of essays on films, directing, philosophy and your biography.